The 2006 Allstate 400 at the Brickyard was the 21st stock car race of the 2006 NASCAR Nextel Cup Series. The 13th running of the event, it was held on August 6, 2006 at Indianapolis Motor Speedway in Speedway, Indiana before a crowd of 280,000 spectators. The 160-lap race was won by Jimmie Johnson of Hendrick Motorsports after starting from the fourth position. Roush Racing driver Matt Kenseth finished second and Richard Childress Racing's Kevin Harvick was third. Jeff Burton won the pole position by posting the fastest lap in qualifying, and held his start line advantage for the next seven laps until Kasey Kahne passed him. Burton retook the lead from Kahne on the next lap, and led the most laps out of any one else (87) as the lead of the race changed eighteen times by nine different drivers. After falling to 39th because of a flat left-front tire on the 39th lap, Johnson recovered lost ground by maneuvering his way through traffic. He became the new leader on lap 117 after overtaking Harvick. Johnson led for a total of 38 laps en route to his fourth victory of the season, his first at Indianapolis Motor Speedway, and the 22nd of his career. After the race Johnson's lead in the Drivers' Championship over Kenseth grew to 107 points. Although Burton finished down the order after slowing midway through the race, he kept the third position. Kyle Busch and Harvick were still in fourth and fifth, and Mark Martin likewise retained sixth the position. Chevrolet maintained its lead in the Manufacturers' Championship, 38 points ahead of Dodge, and 40 in front of Ford with fifteen races remaining in the season. Indianapolis Motor Speedway, where the race was held. The Allstate 400 at the Brickyard was the 21st out of 36 scheduled stock car races of the 2006 NASCAR Nextel Cup Series. It was held on August 6, 2006 at Indianapolis Motor Speedway in Speedway, Indiana, one of six superspeedways to hold NASCAR races, the others being Michigan International Speedway, Auto Club Speedway, Daytona International Speedway, Pocono Raceway and Talladega Superspeedway. Indianapolis Motor Speedway's standard layout is a 2.5-mile (4.0 km) four-turn rectangular-oval track. The track's turns are banked at nine degrees, and neither the front stretch (the location of the finish line) nor the back stretch are banked. Before the race Jimmie Johnson led the Drivers' Championship with 2,939 points, with Matt Kenseth in second and Jeff Burton third. Kyle Busch and Kevin Harvick were fourth and fifth. Mark Martin, Kasey Kahne, Denny Hamlin, Jeff Gordon and Tony Stewart rounded out the top ten. Chevrolet led the Manufacturers' Championship with 150 points; Dodge was second with 117 points, with Ford a close third on 113. Stewart was the race's defending champion. In preparation for the race, NASCAR held the fifth of its six test days for Nextel Cup entrants on July 10–12 at Indianapolis Motor Speedway. Sessions began at 9:00 a.m. EST, and concluded at 6:00 p.m. 58 cars, participated in the July 10 morning session, while 63 were entered for the afternoon session. Dale Earnhardt Jr. was quickest with a speed of 177.518 mph (285.688 km/h) and Robby Gordon had the highest speed of 177.204 mph (285.182 km/h) in the afternoon session. Sterling Marlin, David Stremme, Kenseth, Chad Chaffin and Greg Biffle all damaged their cars in collisions with the barriers lining the track. The second day of testing was cancelled because of rain. The started of the final day of testing was delayed because of further rain where 42 cars took part. Reed Sorenson recorded the fastest speed of all three days of 181.892 mph (292.727 km/h) in the day's sole testing session. Robert Yates Racing development driver Stephen Leicht was entered for the race in his attempt to become the youngest person to qualify for a Nextel Cup Series race in history. His Busch Series race seat was taken by David Gilliland to enable full concentrate on the race for Leicht. After taking the pole position for the Pepsi 400 in July, and leading the race with two laps to go before placing fourth, No Fear Racing's Boris Said attempted to qualify for the round at Indianapolis Motor Speedway. Bobby Hamilton Jr. of Bobby Hamilton Racing confirmed through a press release that he would enter the Brickyard 400, and would also compete in the Craftsman Truck Series race at Indianapolis Raceway Park. Four one-hour practice sessions were held before the Sunday race: two on both Friday and Saturday. Ken Schrader was fastest in the first practice session with a time of 49.911 seconds; Robby Gordon was second and Clint Bowyer third. Hamlin was fourth-fastest, ahead of Casey Mears and Earnhardt. Stremme, Scott Wimmer, Harvick and Paul Menard rounded out the session's top ten drivers. Boris Said made contact with the outside wall leaving turn four, but he escaped with minor damage to his car. In the second practice session, Kurt Busch was quickest with a 49.440 seconds lap, followed by Kahne, Robby Gordon, Scott Riggs, Schrader, Bowyer, Johnson, Reed Sorenson, Burton, and Hamlin. Early in the session, Michael Waltrip hit the turn four wall, but sustained no major damage to his car. Sorenson lost control of his vehicle in turn one, causing him to spin backwards into the wall forty minutes in. Sorenson's car was heavily damaged, and he was transported to the infield care center for a pre-cautionary check-up and later released. Sorenson went into a back-up car. 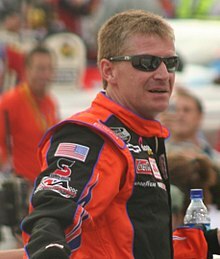 Jeff Burton (pictured in 2007) had the fifth pole position of his career. Although 50 cars were entered in the qualifier on Saturday morning, according to NASCAR's qualifying procedure, only forty-three could race. Each driver ran two laps, with the starting order determined by the competitor's fastest times. A widely believed perception in the paddock was that the first cars to set lap times would have more of an advantage over those that drove later in qualifying as track temperatures rose. In what was considered a "surprise" result, Burton clinched his third pole position of the season, and the fifth of his career, with an early lap of 49.240 seconds. He was joined on the grid's front row by his Richard Childress Racing teammate Bowyer who was two-thousands of a second slower. Kurt Busch qualified third, Kahne took fourth, and Johnson started fifth. J. J. Yeley, Biffle, Ryan Newman, Robby Gordon and Harvick completed the top ten. The seven drivers who failed to qualify were Paul Menard, Waltrip, Johnny Sauter, Kevin Lepage, Leicht, Hamilton and Derrike Cope. After the qualifier Burton said, "I think I left a little bit out there. I ran as hard as I thought I could run and come back. I was a little bit conservative in a few places that if somebody has a little more confidence, they might be able to do better than that." Kahne paced the third practice session with a time of 51.161 seconds. Bowyer was twenty-seven thousands of a second slower in second, and Harvick was third. Fourth through tenth was made up of Kurt Busch, Burton, Kenseth, Stremme, Jamie McMurray, Johnson, and Martin Truex Jr. Kurt Busch's left-front tire blew after deflating, and he collided with the turn one wall. He switched to a back-up car for the remainder of the weekend. Bowyer had a similar issue with his car's left-front tire coming off turn four but he stopped in a safe location. Later that afternoon, Burton set the fastest lap in the final practice session at 51.370 seconds; Kenseth was second, and Carl Edwards third. Bowyer was fourth-fastest, Schrader placed fifth, and Brian Vickers sixth. Hamlin was seventh-quickest, Robby Gordon eighth, Martin ninth, and Harvick tenth. Live television coverage of the race began at 1:30 p.m. in the United States on NBC. Around the start of the race, weather conditions were sunny. Howard Brammer, reverend of Traders Point Christian Church in downtown Indianapolis, began pre-race ceremonies with an invocation. Kelly Rowland of the American girl group Destiny's Child performed the national anthem, and the chairwoman of the Indianapolis Motor Speedway Mari Hulman George commanded the drivers to start their engines. During the pace laps, Chaffin and Dale Jarrett went to the back of the grid for changing their engines, and Kurt Busch did the same after going into his back-up car. NASCAR scheduled a competition caution for laps 15 and 40 to enable teams to check the state of their tires after drivers raised concerns about their lifespan. The race started at 2:54 p.m. Burton maintained the lead going into the first turn, and pulled way to hold a small but healthy gap by the end of the first lap. On the second lap, Bowyer lost second when Johnson overtook him. The first caution was given on lap three as Elliott Sadler lost control of his car in turn one, and heavily clouted the wall with the rear of his car. Joe Nemechek did minor damage to his car when he hit wall try to avoid Sadler. Under caution, Nemechek, Said and Sorenson elected to drive down pit road for repairs, but NASCAR forbade pit stops for fuel because of the first competition caution. Burton led at the lap seven restart, followed by Kahne and Johnson. However, Burton only led for the first two turns as Kahne passed him. Burton retook the first position from Kahne on the next lap. Jeff Gordon went to pit road on lap nine to repair a broken bolt on his left-front sway bar, but he did not get lapped by the leader until three laps after. Biffle was passed by Bowyer for fourth on the eleventh lap. After starting 32nd, Stewart moved into 15th by lap 15. The first competition caution was waved on the next lap. All drivers made pit stops for fuel, tires and track bar adjustments. Burton retained the lead on the lap-20 restart. On the lap, the third caution came out for Said who was hit at the rear of his car by Sorenson, causing Said to collide with the wall between turns three and four, and he came to a rest facing the opposite direction in the infield grass. The race restarted four laps later with Burton still in first. Kahne and Biffle moved past Johnson to claim the second and third positions on the same lap. Just as NASCAR was about to trigger the second competition caution, Johnson's front-left tire went flat on lap 39, and he was worried about potential damage to his front-left fender. Johnson continued to drive slower than the rest of the field until the discarded rubber that was left on the track necessitated the fourth caution. Every driver (including Burton) chose to make pit stops for fuel during the caution. Kenny Wallace staggered his stop, enabling him to lead the 41st lap. As Johnson exited his pit stall, a fire ignited due to him burning fuel that spilt onto the concrete surface but safety crews quickly extinguished the blaze. Burton became the leader once more, and retained it at the restart on lap 45. Kahne dropped to eighth over the next three laps, while Johnson gained eight positions to run 30th by the 50th lap despite a visible left-front tire rub on his car. On lap 58, Jeremy Mayfield lost control of his car in turn two, and drifted up into the wall, triggering the fifth caution. During the caution, some drivers, including Burton, made pit stops for tires and car adjustments. Vickers elected to have only two new tires at his stop, and assumed the lead for the restart on lap 61. Burton passed Vickers to get back the lead on the following lap. Vickers then lost second place to Harvick, before dropping to fifth when Kenseth and Edwards moved past him. Over laps 70 and 73, Harvick and his teammate Burton exchanged the first position before the battle ended with Harvick successfully taking the lead. He subsequently pulled away from Burton. Edwards moved ahead of Burton for second on the 77th lap as he was seeking to get closer to Harvick. Eight laps later, Burton was demoted to fourth when Kenseth overtook him. A sixth caution was needed on lap 86 when debris was located in turn three's high groove. The entire field chose to make pit stops for tires and car adjustments under the caution. Edwards fell from second to eighth because his stop was problematic as his crew could not correctly fit a lug nut for his front-right tire. Harvick stayed in the lead at the lap 90 restart, and began to pull away from Kenseth. Jimmie Johnson (pictured in 2007) recovered from a flat front-right tire early in the race to claim his fourth victory of the season. Kenseth drew alongside Harvick, and passed him to take the lead on lap 110. By lap 115, Burton slowed and he fell to seventh. After falling to 39th, Johnson recovered several positions as he maneuvered his way through traffic. He moved past Harvick for second on the 116th lap. On the lap after, Johnson passed Kenseth on the backstretch for the lead. Johnson began to pull away from the remainder of the field. Green flag pit stops began on lap 123 when Biffle came onto pit road. Johnson stopped on the following lap, giving the first position to Kenseth. Kyle Busch and Nemechek each led one lap before making their own separate pit stops. After the pit stops, Johnson regained the lead. On lap 140, Johnson's lead of 1.826 seconds was reduced to nothing when the seventh caution was given for debris in turn three. Johnson and most of the field elected to make pit stops for tires and car adjustments under caution. Kyle Busch chose not to make a pit stop, and led the field at the lap 147 restart, with Earnhardt second and Newman third. Further down the field, three-abreast racing occurred, as drivers on worn tires tried to fend off the attacks from those on newer tires. After emerging from the pit stops in eighth, Johnson returned to the top three by the 150th lap. The following lap, Earnhardt overtook Kyle Busch in turn two to become the new leader. Earnhardt held it until Johnson got by him in turn four. Kenseth moved past Earnhardt for second on lap 152 as the latter's old tires meant he lost further positions over the next four laps. As Johnson started the final lap, he led Kenseth by 2.13 seconds when the final caution was necessitated for two separate crashes that ended competitive racing. Riggs ran into the rear of Robby Gordon's vehicle who slid upwards into the side of Biffle's car; both drivers spun leaving turn two. While battling Stewart for eighth, Kahne oversteered and slowed, causing Edwards to tap Kahne and the latter spun 360 degrees and went into the wall at turn three heavily with the front of his car. Kahne was uninjured. Other drivers involved were Hamlin, and Tony Raines. The field was frozen in place, with the order of finish determined by where the drivers were when the caution began. This gave Johnson his fourth victory of the season, his first at Indianapolis Motor Speedway, and the 22nd of his career. 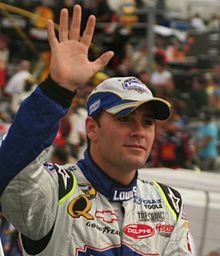 Johnson's achievement made him the second driver after Jarrett to win the Daytona 500 and the Brickyard 400 in the same year. Kenseth finished second, Harvick came third, Bowyer took fourth, and Martin placed fifth. Earnhardt, Kyle Busch, Stewart, Edwards, and Hamlin completed the top ten finishers. The race had a total of eight cautions and 18 lead changes by nine drivers. Burton led six times for a total of 86 laps, more than any other driver. Johnson led three times for 33 laps. Johnson appeared in Victory Lane after his victory lap to celebrate his fourth win of the season in front of the crowd; the win earned him $452,861. He said that he doubted his ability to win at Indianapolis Motor Speedway, "I've watched so many races here as a kid growing [up]. I thought I would come here in an Indy car. I drove in the off-road ranks and idolized Rick Mears, Roger Mears, Robby Gordon, and those guys all came out of off-road racing to Indy car. I hoped to win here in an Indy car. I can't believe I'm here in a stock car in NASCAR winning the biggest race." Johnson continued, "I knew we had a fast race car. We had to come through traffic, and that made it harder on the tires." Kenseth reserved praise for his crew chief Robbie Reiser but spoke of his disappoint after he could not win the race, "The 48 [Johnson] came out of nowhere and blew by us all and won the race. He just got through traffic better than us. He just did a better job of being in the right place getting through those cars." Third-placed Harvick said he could not challenge Johnson due to his fast pace, "He pretty much had us all covered. ", and, "We had a good car, but we got a little bit behind on the last pitstop. We put on four tyres but didn't have enough time left." Kahne was the most affected of all the drivers in the provisional Chase for the Nextel Cup standings after his last lap crash with Stewart. He said, "I was trying to get in a battle with all those guys for positions sixth, seventh and eighth. Trying to pass Stewart, I got loose. I was trying to stay off Tony and I guess I ran into the wall." After going airborne from driving over debris scattered on the track from Kahne's car, Raines said, "He got loose and overcorrected. Whatever fell out of his car was the size of a beer cooler. I was surprised the car even drove back. I think the bottom was all torn up." Nevertheless, Stewart spoke of his happiness over coming eighth despite losing positions because of a mistake by his pit crew, "I think I passed 60 cars or more today. We got ourselves into the top 10 early in the race, and just had an airgun break on a pit stop ... we came in and made sure the lug nuts were tight, went to the back, and then battled our way back into the top 10, so I'm pretty happy." Earnhardt said that while he could not take the victory, he was attempting to maintain his position to the best of his ability, "I'd love having a better car and not having to make that call (to stay out). We can't make the Chase with 30-place race cars. We took a chance and made it work and just got lucky." The result kept Johnson in the lead of the Drivers' Championship with an increased margin of 107 points over Kenseth. Burton maintained the third position, while Harvick's third-place finish allowed him to tie with Kyle Busch on points for fourth. Martin stayed in sixth and Hamlin advanced to seventh. Rounding out the top ten were Jeff Gordon, Stewart and Earnhardt. Johnson said about his elongated lead, "It’s way too early to say we’ve broken the pattern, but this is a great start." In the Manufacturers' Championship, Chevrolet maintained its lead with 159 points. Dodge remained in second with 121 points with Ford another two points behind in third. The race took two hours, 54 minutes and 57 seconds to complete; because it ended under caution, no margin of victory was recorded. ^ a b c d e f g h i j "The Race: The Allstate 400 at Indianapolis Motor Speedway". Jayski's Silly Season Site. ESPN Internet Ventures. Archived from the original on December 13, 2017. Retrieved June 23, 2016. ^ a b c d e f g h i j k l m "2006 Allstate 400 at the Brickyard". Racing-Reference. USA Today Sports Media Group. Retrieved June 23, 2016. ^ "2006 Allstate 400 at the Brickyard weather information". Old Farmer's Almanac. Yankee Publishing. Archived from the original on December 8, 2015. Retrieved November 28, 2015. ^ "NASCAR Race Tracks". NASCAR. Turner Sports Interactive. Archived from the original on June 28, 2011. Retrieved July 8, 2011. ^ a b "NASCAR Tracks—The Indianapolis Motor Speedway". NASCAR. Turner Sports Interactive. Archived from the original on June 28, 2011. Retrieved July 8, 2011. ^ a b "2006 Official Driver Standings: Pennsylvania 500". NASCAR. Turner Sports Interactive. Archived from the original on February 20, 2007. Retrieved June 23, 2016. ^ Horner, Scott (July 19, 2015). "Brickyard 400 history: 21 years at Indianapolis Motor Speedway". The Indianapolis Star. Gannett Company. Archived from the original on May 12, 2016. Retrieved June 23, 2016. ^ "2006 Nextel Cup Testing News – Indianapolis Motor Speedway – July 10–12, 2006". Jayski's Silly Season Site. ESPN Internet Ventures. Archived from the original on October 29, 2007. Retrieved June 23, 2016. ^ Dutton, Monte (August 4, 2006). "NASCAR This Week". The Berkshire Eagle. p. C4. Archived from the original on August 24, 2018. Retrieved August 22, 2018 – via NewspaperArchive.com. ^ Hart, Jay (August 3, 2006). "Said far from done, if fans have their say". The Morning Call. Archived from the original on August 24, 2018. Retrieved August 22, 2018. ^ "Fastenal and BHR Ready for Double Duty in Indy" (Press release). Fastenal Racing. July 26, 2009. Archived from the original on August 28, 2006. Retrieved August 22, 2018. ^ "Practice 1 Speeds". NASCAR. Turner Sports Interactive. Archived from the original on August 6, 2006. Retrieved June 23, 2016. ^ a b c Teverbaugh, Rick (August 5, 2006). "Busch fastest on first day on Brickyard Weekend". The Herald Bulletin. Archived from the original on September 8, 2018. Retrieved August 22, 2018. ^ "NASCAR Practice 2 Speeds for the 2006 Allstate 400 at the Brickyard". Fantasy Racing Cheat Sheet. August 6, 2006. Archived from the original on August 24, 2018. Retrieved August 22, 2018. ^ Long, Dustin (August 4, 2006). "Burton leads RCR dominance with pole win at Indianapolis". News & Record. Retrieved August 23, 2018. ^ a b c "Race Lineup: Allstate 400 at the Brickyard". NASCAR. Turner Sports Interactive. Archived from the original on February 21, 2009. Retrieved August 23, 2018. ^ a b Castleman, Aaron (August 5, 2006). "Burton wins another pole". WTHR. Associated Press. Archived from the original on August 24, 2018. Retrieved August 23, 2018. ^ a b c Aumann, Mark (August 5, 2006). "Kurt Busch victimized by ongoing Indy tire issues". NASCAR. Turner Sports Interactive. Archived from the original on December 3, 2006. Retrieved June 23, 2016. ^ a b c d e f g h i j k l m n o p q r s "Lap-by-Lap: Indy". NASCAR. Turner Sports Interactive. August 7, 2006. Archived from the original on May 11, 2007. Retrieved August 22, 2018. ^ Pockrass, Bob (August 6, 2006). "Competition yellows, mandatory air pressures set for Brickyard". NASCAR Scene. Street & Smith Sports. Archived from the original on August 21, 2008. Retrieved August 22, 2018. ^ a b c d e f g h i j k l m n o Jensen, Tom (August 6, 2006). "Instant Analysis: Brickyard 400". Fox Sports. Archived from the original on February 17, 2008. Retrieved August 22, 2018. ^ a b c d e Pearce, Al (August 6, 2006). "The Beatdown Continues: Jimmie Johnson gets his first Brickyard win and pads his points lead". Autoweek. Crain Communications. Archived from the original on August 24, 2018. Retrieved August 23, 2018. ^ a b Anderson, Lars (August 14, 2006). "Flat-out Fast". Sports Illustrated. 105 (6): 74. Archived from the original on August 24, 2018. Retrieved August 23, 2018 – via EBSCO Host. ^ M. Fulton, Scott (August 10, 2006). "How the 'freeze-the-field' rule led to NASCAR's Mobile Technology Center". Tom's Hardware. Archived from the original on September 8, 2018. Retrieved August 23, 2018. ^ Long, Dustin (August 6, 2006). "Johnson outruns Indy ghosts; NASCAR's points leader overcomes early troubles to score fourth win". The News & Record. Retrieved August 23, 2018. ^ a b Hinton, Ed (August 7, 2006). "Johnson Finally Prevails At Track That Vexed Him". Sun-Sentinel. p. 1. Archived from the original on August 24, 2018. Retrieved August 24, 2018. ^ Redmayne, Tim (August 6, 2006). "Johnson storms to Brickyard win". Autosport. Haymarket Publications. Archived from the original on August 24, 2018. Retrieved August 24, 2018. ^ a b Bloodworth, Bryan (August 7, 2006). "Brickyard notes". The Pantagraph. Archived from the original on August 25, 2018. Retrieved August 23, 2018. ^ Caldwell, Dave (August 7, 2006). "At the Brickyard, Johnson Outraces His Hard Luck". The New York Times. Archived from the original on August 24, 2018. Retrieved August 23, 2018.